In 1899, when Artus Van Briggle stepped off the train in Colorado Springs he must have felt worlds away from the studios of Paris and the landscapes of Italy where his extraordinary talents had so recently flourished. Here, however, surrounded by the beauty of the Rocky Mountains, the defining moments of his life would occur; the twin destinies of a great artistic triumph and an imminent personal tragedy would unfold, leaving in their wake the dawn of a 100 year artistic legacy - Van Briggle Pottery - an American tradition in art pottery since 1899. Artus Van Briggle, an American artist of Dutch descent, was established as a world class painter in Europe. Having been trained at the finest academies there, and with paintings accepted by the Paris Salon, he received the highest honors for a painter in his day. Yet his artistic passions would ultimate lead him away from his brush, canvas, and easel toward another artistic pursuit that would ultimately define his genius. Though Artus was a brilliant painter, his artistic passions were most eloquently expressed in the forms and colors of one of history�s oldest arts - pottery. From his years as a celebrated artist at the famed Rookwood Pottery in Ohio he knew first-hand the extraordinary range of expression an artist could achieve with the potter�s materials. His pursuit was the creation of exquisite satin matte glazes, like those he�d seen on ancient Chinese masterworks, in a palette of glorious colors, never achieved by any artist in modern times. The materials this brilliant artist would use for his greatest artistic pursuit would be minerals from the earth - clays, feldspars, oxides, - and the glowing orange flames of a fiery kiln. When transformed by the creative mind and the skilled hand these materials become the essence of both humanity and nature blended in unity. Clay and glaze are indeed extravagant media, offering the artist a lifetime of challenges and rewards. Artus, however, didn�t have a lifetime - tragically, he had contracted tuberculosis and, though a relatively young man, his future was uncertain. Artus had achieved some success in discovering a formula for these beautiful matte glazes prior to his arrival in Colorado but he continued his work there, seeking a standard of perfection not yet achieved. Pottery is a melding of art and science, and during the time when he conducted his experiments Artus knew success could not come without the patience of a scientist and the passion found in all great artists. He pursued his vision with tireless effort, though the effects of failing health often interrupted his progress. No specific date is recorded, but one day in the spring of 1901 he reached into the kiln, with the anticipation known well by countless potters throughout the ages, and finally held in his hands the perfect, rich, matte-glazed pottery he had sought for so long - the first pieces created in centuries, the first ever on this side of the world. Against the odds of failing health and a pursuit which no western artist had ever achieved, he succeeded; his passion was realized - a lost art was now reborn. The world would once again see and touch of the soft marble-like glazes first known by ancient Chinese masters half a world and so many generations away. When you hold in your hand a piece of fine artistry and craftsmanship, a human creation with elegant lines and a sensual surface - something experienced by the eyes and hands and ultimately felt by the soul, you�ll know what Artus Van Briggle was seeking - and what he ultimately achieved. He lived to see his artistic passion fulfilled before his own mortality could eclipse his dream. Though the sun setting on his own life, a new era was on the horizon for one of the oldest arts in history. Once perfected, Artus Van Briggle�s exquisite new glazes graced his elegant Art Nouveau pottery designs which were sent across the Atlantic and, when shown to Europe�s best art judges, were proclaimed, "A supreme discovery in modern ceramics." Soon, art critics across the continents marveled at his works, lavished him with praise, and brought international acclaim to this quiet American artist on the Colorado frontier. Before long, he succumbed to tuberculosis and died there in the shadow of the Rocky Mountains, but not before receiving word that when shown at Exhibitions here in the United States and in the Salons of Europe, his creations had won their highest awards. Van Briggle - a Tradition in American Art Pottery since 1899. 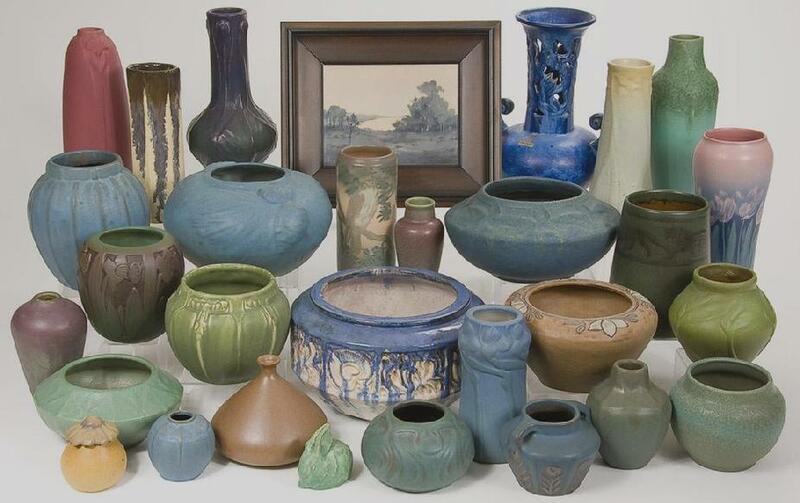 Dozens of glaze colors, hundreds of designs, hundreds of thousands of pieces created - all bearing one name - the name of the brilliant artist and his wife whose lives left a permanent and timeless imprint on the tradition of American art pottery. 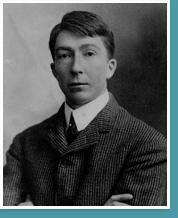 This is the Van Briggle legacy - begun in 1899. With the passing of time new chapters are added, and this artistic legacy is as alive today as any time in its history. Each day the Van Briggle studios produce the early designs of its founders, Artus and Anne Van Briggle, as well as pieces created over the years that compliment their celebrated style, in a variety of colors - both historic and contemporary. At Van Briggle Art Pottery in Colorado Springs, the beginning of a new millennium brought the dawn of a new century in this Van Briggle legacy. Beginning our second hundred years of creating fine art pottery, we find ourselves returning to our roots. Simultaneously, we are looking to the future, contemplating what legacy we will leave for future generations. We are surrounded by evidence that we bear the name of a creative genius, highly acclaimed in his day, and the dedication of so many artisans and staff over the past 100 years, which brings a deep sense of joy as well as responsibility. Almost daily we experience poignant reminders of the Van Briggle legacy: someone walks into our showroom with a piece of Van Briggle wrapped in a towel or newspaper, placed in an old shoe box, with a story of how their grandmother purchased this piece 75 years ago on a trip to Colorado Springs - and that she wouldn�t part with it for any price; we walk into a museum in Pasadena, California and unexpectedly see a small collection of Van Briggle pieces, all bearing dates from the early 1900�s; we receive a telephone call from a collector who just bought an old "Lorelei" vase for a few dollars in a box lot at a farm sale somewhere in the Midwest - the farmer and his family had purchased the piece years ago when they came to Colorado after the harvest was in; while on a visit to the Metropolitan Museum in New York or the Smithsonian in Washington, D.C. we find pieces of Van Briggle pottery among their permanent collections. Stories like these remind us that the work of our hands today is the continuation of a celebrated artistic heritage begun over one hundred years ago. Indeed, we do feel a responsibility that is both sobering and exciting as we continue the legacy of Artus and Anne Van Briggle. Their names hold a distinctive place in the history of fine and decorative arts. The desire to continue an honored tradition brings with it a dilemma: how do we continue their artistic legacy without simply mimicking its earlier sublime creations? We want to know that if Anne and Artus were to miraculously return to us one day, as we open another kiln filled with art pottery bearing their name, they would see designs and glazes they would cherish in their hands and hearts, as we hold theirs in ours. We would want them to recognize the pottery pieces inscribed with their name. However, knowing they were accomplished artists, we would also want them to say, "...and how you have grown with the years!" We must stay true to our past, yet we must evolve and grow � after all if art is anything, it is dynamic! Clay is a particularly versatile medium for an artist. A survey of what is produced by potters around the world shows that, more than any other medium, clay offers the artist extraordinary scope of expression. As artists and artisans here at Van Briggle, we occasionally monitor what other artists are doing with clay and glaze. Fads and trends have their moments in time, and it can be tempting to follow these more immediately accepted styles and idioms, though they lay beyond the bounds of the Van Briggle tradition. However, we are repeatedly drawn to one over-riding goal - to establish an aesthetic that transcends time; to create a style unique to our heritage that establishes itself by continually reaffirming its principles; to explore new ways of expression while always being reminded of their origins. In judging the viability of each new design or glaze we find ourselves asking these questions: Does it look like Van Briggle? Is it worthy of bearing that name? Is it informed by our legacy without simply repeating it? An overview of Van Briggle pieces over the last century shows hundreds of designs with flower, animal or human subjects artistically applied to pottery forms. Typically, these pieces are highlighted with a soft matte glaze - Artus Van Briggle�s passion. The subject of Van Briggle is, essentially, nature, which for all intents and purposes is an inexhaustible source for the artist. Themes and motifs inspired by nature can be interpreted and reinterpreted indefinitely on graceful forms. Matte glazes may be created with a broad range of hues to enhance and lend these forms a soft satin touch. A viewing of our current inventory shows a number of designs created by Artus and Anne Van Briggle that have been produced continuously since the early 20th century. Along with these, one finds distinctive designs by other artists that have been added to the collection over the years. Of course the majority of pieces are glazed with the signature Van Briggle matte glaze - one of Artus� most profound achievements - in various colors. Over the past two decades we have carefully identified and retained only the designs we feel fit most appropriately into the Van Briggle style, and have eliminated others that do not. When new designs are added they are carefully selected to enhance and further the Van Briggle tradition. Artus Van Briggle established his pottery during the Arts and Crafts movement, a time when many artists and craftsmen were creating their works in reaction to the mass production of the industrial revolution. Though the scope of the Van Briggle tradition is broader than the movement, Van Briggle�s work fits well within its emphasis on making hand-crafted art available to a wider public. In the same way, it is our goal in an era dominated by ever increasing emphasis on technology, to provide our society with a counterpoint of artistry and hand craftsmanship. What could be more rewarding? Reminders of the Van Briggle legacy are all around us. An old black and white photograph immortalizes a moment when Artus posed outside a kiln while the earliest Van Briggle artisans brought pieces for his inspection. A former employee describes how the kilns used to be fired with coal, which he remembers shoveling by hand. A pottery piece from 1902 has mysteriously acquired a look and feel that only the passing of time will create. These reminders and countless others renew and strengthen our resolve to continue the tradition. Each day brings a sense of excitement and anticipation; there is no end in sight to the Van Briggle legacy. Inspired by the essence of our style, successive generations can continue to express the timeless and endless themes found in nature, interpreted through creative minds and skilled hands. Artus and Anne Van Briggle�s aims and values were noble and sincere. As we remain true to these goals, the Van Briggle tradition, begun so many years ago, will continue long into the future. Samples of Van Briggle bottom markings. Top: 1903; Middle: c. 1960; Bottom: 2004. Born to artistic parents on March 21, 1869, Artus Van Briggle had an early introduction to painting using materials found about the home. The Van Briggle family lived in Ohio, one of America's hotbeds of ceramic design. At the age of 17 he moved to Cincinnati, Ohio, where he decorated china dolls at the Arnold Fairyland Doll Store, while attending his early art studies at the Cincinnati Art School. After a stint at the Avon Pottery where he was introduced to the ceramic arts, Artus took a job at Rookwood Pottery; there he excelled at hand-painting designs. His skill and talent were recognized by Rookwood founder, Maria Storer, who became his benefactor, even sending him to France to study art at the Acad�mie Julian in Paris. In Europe, he was exposed to many styles of art and became infatuated with an early matte glaze from the Chinese Ming Dynasty; a type that was lost to history. Artus also met his future wife, fellow American student Anne Lawrence Gregory, an accomplished artist in her own right. Finishing their Paris studies in 1896, they returned to America. Artus resumed his work at Rookwood and also started sculpting and experimented with recreating the lost Ming Dynasty glazes. 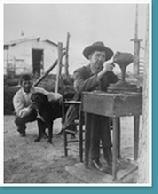 In 1899, struggling with health issues due to tuberculosis, Artus left Rookwood and moved to the drier air of Colorado Springs, Colorado. In Colorado, he pursued his own styles of pottery, centered around the Art Nouveau movement, and to continue his research on the ancient matte glazes that had fascinated him in Paris. After two years of trials and experiments a matte glaze was perfected. Artus opened Van Briggle Pottery in 1901 and was joined by Anne Gregory, who took a position as a high school art teacher in Colorado Springs. In 1902, Anne and Artus were married, and she devoted herself to their pottery; she created many designs and collaborated in all aspects of the enterprise with her husband. Late 1902 brought Van Briggle awards for his glazes and designs in Art Nouveau from the prestigious Paris Salon; he was now an accepted artist. During their early years, Artus and Ann established hundreds of Art Nouveau styles of pottery under the Van Briggle name. A display at the 1904 Centennial Exhibit in St. Louis won Van Briggle more awards and greater international fame. Artus Van Briggle died in July 1904, at the age of 35. Anne continued the pottery using the forms created by Artus as a foundation and adding many more designs of her own. In 1907, Anne and pottery stockholder and city-founder William Jackson Palmer began construction on a new pottery on Uintah Street. The Van Briggle Memorial Pottery � designed by Dutch architect Nicholas Van den Arend � was opened in 1908 and stands today as an historic landmark noted for its architecture and use of ceramics in the facade. Having remarried in 1908, Anne Louise Gregory Ritter leased the pottery in 1910 to Edwin DeForest Curtis and moved to Denver, where she would concentrate on painting and where she remained until her death in 1929. In her absence, the pottery fell under financial hardships and was sold at sheriff's auction; later it was re-sold, once more becoming the property of Mr. Curtis. Throwing on the potter's wheel at Van Briggle's Memorial Plant, circa 1948. Clem Hull. The pottery was sold twice more in the ensuing decade and survived a fire in 1919 that gutted the interior but left the brick shell and kilns. New owners I.F. and J.H. Lewis took the opportunity to modernize and expand the facility beginning in 1920 and stabilized the production and financial aspects of the pottery for the first time. Despite a flood in 1935 that destroyed much of the company's records and many moulds, the pottery continued to enjoy success up to World War II, when they closed for approximately three years as the United States focused its resources on defeating fascism. With the increase of internal travel in the United States a freeway was planned in 1953 for Colorado Springs which J.H. Lewis estimated would run through the Memorial Plant site. Although the freeway eventually was planned to avoid destroying the historic pottery, Mr. Lewis nonetheless put into action plans to relocate the pottery to a higher-traffic area of Colorado Springs. In 1955, Mr. Lewis and Clem Hull brought a new facility on line at a renovated railroad roundhouse on Midland Road. The new facility, known as the Midland Plant, had a smaller capacity but enjoyed quick success due to its location on the main highway to the Garden of the Gods and other tourist locations. 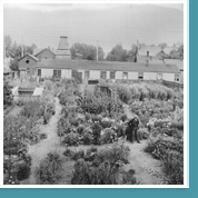 In 1968, Mr. Lewis sold the Memorial Plant to Colorado College, and it fell into disrepair for the ensuing 40 years, being used variously as offices and storage. American tastes in the 1950s turned to modern designs and all things glossy, so Van Briggle embarked on a new era which saw the pottery continue to produce the traditional matte glazes and Art Nouveau designs, but which also saw the introduction of more trendy gloss glazes and modern designs. Longtime employee Kenneth Stevenson took majority control of the company in 1969, and the pottery continued to produce two distinct lines and enjoyed a period of expansion and relative stability under the production supervision of Fred Wills. Mr. Stevenson died in 1990, leaving the pottery to his wife Bertha Stevenson and their son Craig A. Stevenson, now Van Briggle's chief designer. "If Artus Van Briggle walked in and saw our production facility today," according to Craig Stevenson, "he would certainly recognize a lot of what we're doing." Throughout its history, Van Briggle Pottery has attracted some talented artisans and, since at least the 1930s, has featured tours and live displays of potters "throwing on the wheel." 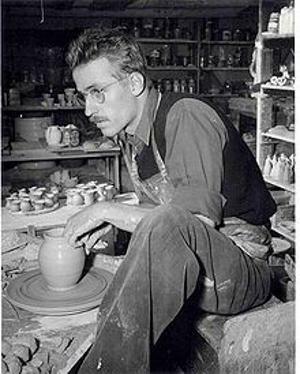 Potters who have worked at Van Briggle include Ambrose Schlegel, Harry Bangs, Nellie Walker, William Higman, Clem Hull, Gene Hopkins, Fred Wills, Nelson Curtis, Joe Jezek, Craig Stevenson, Mark Sucharski, and Becky Hansen. Collectors identify Van Briggle pottery by its distinctive glazes, shapes, and bottom markings. At left are samples of typical Van Briggle bottoms markings. Most such marks were hand-incised, so varied over time and between individuals. The Van Briggle logo consists of a pair of conjoined A's inside a box, and is featured on most � but not all � Van Briggle pottery. Other marks that might appear on the bottom of their pottery include the text, "Van Briggle", some form of "Colorado Springs, Colorado" (most frequently abbreviated), artist marks indicating the artist who threw the piece or finished it, or both, clay batch numbers, and year of manufacture indicators. The variety of marks is broad and beyond the scope of an encyclopedia article to list.